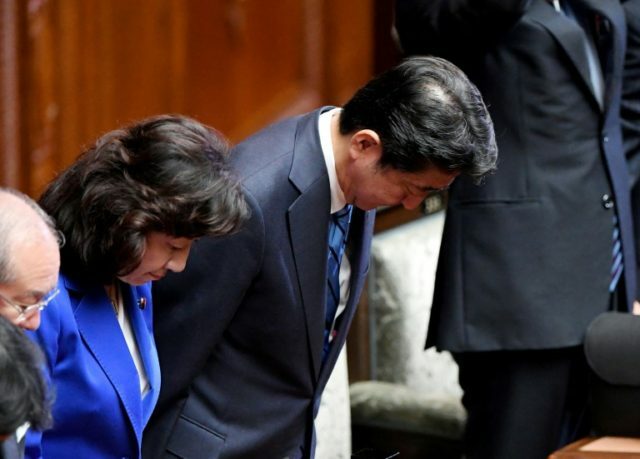 Tokyo (AFP) – Japanese Prime Minister Shinzo Abe officially dissolved parliament Thursday, effectively kicking off a national election campaign where he faces an unexpected and formidable challenge from the popular governor of Tokyo. After the speaker officially dissolved parliament, members of the lower house raised their arms and shouted “Banzai” three times — the Japanese equivalent of “three cheers” — before breaking into applause. Voters in the world’s third-biggest economy are expected to go to the polls on October 22, as Abe seeks a fresh popular mandate for his hardline stance on North Korea and a new tax plan. Abe stunned Japan on Monday with a surprise call for a snap election, seeking to capitalise on a weak opposition and a boost in the polls, as voters welcome his hawkish North Korea policy. But Tokyo Governor Yuriko Koike has upended Japanese politics in recent days, stealing Abe’s limelight with her newly launched “Party of Hope” that seeks to shake up the country’s lethargic political landscape. Koike’s new party, formally unveiled Wednesday, has attracted an influx of lawmakers from a wide range of ideological backgrounds and could unify opposition to Abe, presenting Japanese voters with a credible alternative to the premier. For the moment, although Koike is leading the party, she is not running for a seat in parliament, preferring to concentrate on governing the world’s most populous city in the run-up to the 2020 Olympic Games.